COZINHA CONTEMPORÂNEA - A comida do Térèze é deliciosa. O restaurante serve brunch aos domingos. Variedade de sabores, pratos incríveis com um preparo todo especial. Destaco o mil folhas de rosbife e confit de pato, a salada de burrata e o pavê de salmão. As sobremesas também merecem ser enfatizadas. O Petit Gateau com sorvete de cupuaçu é maravilhoso. AMBIENTE SOFISTICADO – Linda decoração, com uma vista exuberante. Repleto de vegetação, ele é aconchegante, agradável e romântico. As mesas de madeira são iluminadas por pequenas cúpulas vermelhas, que dão um charme especial ao local. SERVIÇO IMPECÁVEL - A equipe é muito prestativa e serve a todos com profissionalismo. Digno de um restaurante cinco estrelas. Perfect place for a special evening out! Tereze is simply the best place to eat in Rio! I will definately come back next time I am in Rio! incredible high view of BA. Funky neighborhood all around which made this marvelous setting all the more impressive. the very expensive 5 course tasting menu by the Michelin rated chef required all of the table to order it. I asked if the chef would make an exception if I promised not to share a single bite and he agreed. What a nice surprise. It was better than any other Michelin starred restaurant I have enjoyed anywhere in the world. Excellent food and ambient. Definitely recommend and will be back! The area of St. Teresa was not what we expected, As it is not touristy and 'Artsy'. The streets getting there are very steep. It rained and our taxi could not make it up one of the streets and had to turn around and go another way. That being said, the food, service and atmosphere of The Terese were wonderful. Best meal in Rio and the service was very friendly, english speaking (or tried). We didn't know what to expect, other than reading others reviews, of the great view good food and great service. This is 'Fine Dining', well done. Two dinners, a bottle of wine and dessert, was 450 ria ($145 US). But, it was worth every penny. Better than Foco de Chao, which was also very nice, but quite crowded. We were the 1st customers at 7:30 and by 8:30 there were 4 other tables. We felt like royalty. 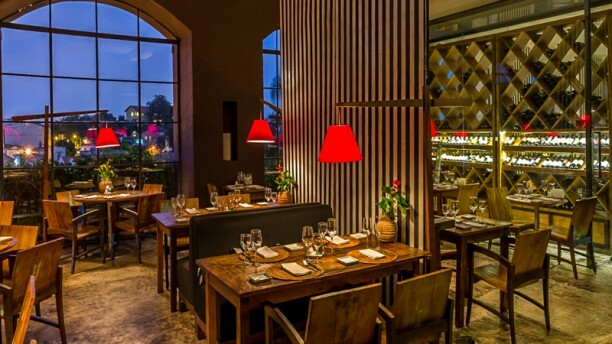 You must spoil yourself and try this restaurant, during your stay in Rio. We felt directly like home, because we were welcomed in such a kind and friendly way a friend would do... Food was great and good quality . Ambience is really comfy and nice. Restaurante delicioso, aconchegante e lindo! Recomendo! Not the stunning restaurant experience that we expected from some of the reviews, but OK. Of note very stylish and very uncomfortable chairs. The service was faultless and the staff were incredibly well-attuned at making your evening flow perfectly. The food was spectacular - certainly worth the price paid. Thank you for a wonderful evening. Fiquei bastante impressionado com este restaurante. O ambiente é muito agradável, atendimento excelente e a comida muito boa. Como um Baião de 6 e minha esposa uma massa veggie a base de palmito pupunha delicioso. O drink especial da casa, uma mistura de vodka Absolut mango com toque de maracujá delicioso. Recomendo. Foi uma experiência ótima, ficamos extremamente felizes em comemorar nosso aniversário de casamento no Térèze. O menu é incrível, e todos, sem exceção, são extremamente cordiais e gentis. A beleza e ambientação também de extremo bom gosto.